We build you exactly the MAN you need. The one you want. The possible applications of our trucks are as versatile as your requirements. At MAN Individual, we optimise our series-production vehicles according to your specific requirements, exactly to your specifications. We build you exactly the MAN that you need. The one you want. MAN Individual delivers you custom-made individual solutions. Based on our model range, we optimise the series-production version of the vehicle exactly according to your specifications. We design, construct and build your very own personalised MAN - all from a single source and customised, nothing off the shelf. You tell us your requirements and we make them reality. Because one thing is certain: Nobody knows our vehicles as well as we do. And any modifications to series-production vehicles are best left to those who built them: Us. You are a body manufacturer and want to cater to your customers’ requests in the best way possible? But no series chassis matches your special bodies? MAN Individual supports your individual special requests and delivers precisely the chassis that you want. This means that you don’t have to worry about modifications but can instead focus completely on your core business, the body. You are an end user and have individual requirements which cannot be fulfilled by standard equipment? MAN Individual offers you custom-made solutions. Without loosing the benefits of a series product, such as competence from a single source, maximum reliability and robustness, MAN warranty, as well as support and spare parts supply. You need a complete vehicle solution for the special purpose vehicle that you want, where everything from driver’s cab to axles fulfils your individual requirements? The MAN Individual team can look back on decades of experience in building special purpose vehicles. This means we can optimally coordinate your individual requests and create top quality system combinations. A vehicle as individual as your requirements. Give your vehicle its own unique character. Inspire yourself and others - every day and on every journey. Create your own perfect feel-good atmosphere on board - whether for driving or breaks. And drive an MAN that is unmistakably yours - inside and out. MAN Individual offers many different ways to optimally customise the interior and enhance the exterior appearance of your truck: from special foils, stainless steel components and exterior LED lighting accents to customised leather upholstery in the interior, tailor-made built-in cupboards with microwave and coffee machine, LED lighting with variable colour setting, multimedia and TV integration, hammock and much more. MAN offers individual design details, tailor-made on-board comfort and impressive, exclusive exteriors from a single source: Your personal MAN Individual contact partner will advise and assist you with preparing a quote, implementation and vehicle handover. 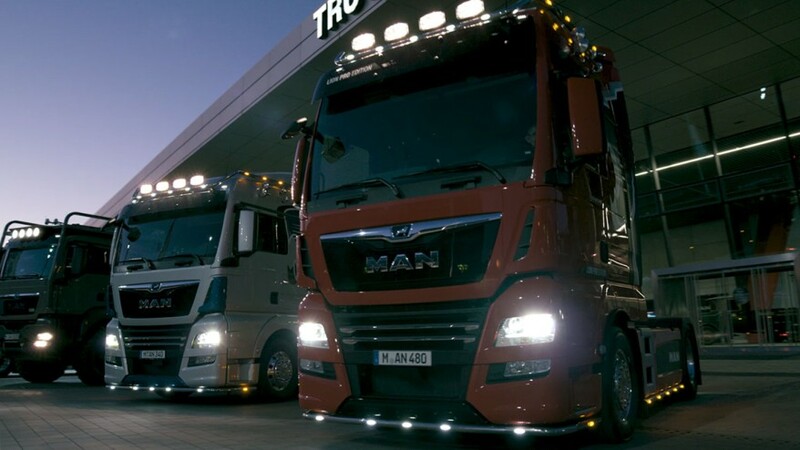 MAN Individual offers you transport solutions tailored exactly to your needs. Over 30 years of experience in modifying commercial vehicles have not only given us all the required expertise but also the flexibility to work together with you on the right solution. Our portfolio: Individual or complete solutions which are tailored exactly to your needs. Everything from a single source and in keeping with the highest MAN quality standards. At MAN Individual, we prepare exactly the chassis our partners need for each special body. This means there is no need for cost-intensive adjustments and you can fully concentrate on your core competence. You receive a custom-made chassis which allows you, as a body manufacturer, to fulfil individual customer requests without missing out on the benefits of a chassis from series-production. Our modified chassis are equal in quality, compatibility and warranty. We build your MAN Truck exactly to your requirements and wishes. We offer everything from a single source and in original MAN quality: from individual modifications to the cab, chassis, drive train and vehicle electronics to exclusive finishes for the exterior and interior. On request, the MAN Individual Team can equip your MAN Truck with additional video assistance systems - for more safety on the road. We also plan and implement sector-specific vehicle solutions for a wide variety of applications. We enhance your MAN Truck to your wishes and requirements: MAN Individual makes your vehicle truly unique - from the exterior look through to the design and feel-good atmosphere of the entire driver's cab. Benefit from our extensive vehicle refinements from a single source: Our MAN Individual team will assist you to implement your preferences for the interior of your MAN truck and to realise an unmistakable exterior appearance - whether as a one of a kind vehicle or a special edition for your company fleet. Our extensive portfolio of MAN truck modifications fulfils virtually any requirement. We realise individual adjustments or complete system combinations exactly according to customer requirements. Our modular competence particularly lies in the modules: Driver's cab, chassis, driveline and electronics. Each of our driver's cabs offers maximum living comfort and plenty of stowage space. In addition, we also implement any special individual requirements that you might have. Anything is possible, inside and out. Whether roof recesses, driver's cab reductions or extensions, driver’s cab glazing, bench seats or beds - our core competences cover any kind of customer specific driver’s cab modification. Next to the engine, the chassis is the technical foundation of every vehicle. We take care of: fine tuning for axles and wheelbase changes, installation of additional axles, repositioning of leading and trailing axles, fitting of mechanical or hydraulic systems or adjustments to the wheelbase. Of course this also includes special body designs, additional equipment, and any other preparations. Optimally adapted to your individual requirements, we integrate: specialised drive systems - manually, in form of a semi-automatic manual gearbox, or fully automatic, retarder for wear-free braking or for vehicles with driven attachments or body components or with low working speed. We equip your MAN Truck with just the right electronic components for your ideal vehicle: from additional lighting, warning devices and radio technology through extra sockets, battery maintenance systems or exclusive infotainment to specific electronic solutions. This also includes programmability for the vehicle speed and rpm, control displays for driving instructors or additional fire-fighting equipment. We prepare your MAN optimally for its specific area of application. Because every business is unique. The series version of the vehicle is modified individually or in modular form according to customer requirements. We have been building trucks for over a hundred years and we know the requirements of our customers in all areas. MAN Individual ensures perfect synergy between all components. Our professionalism and experience, our network of specialists and comprehensive MAN service allow us to offer our customer not only custom-made solutions for specific individual requirements but also for the complete vehicle. From preparing a quote, throughout the construction phase, right up to final assembly, including MAN quality assurance. And our service is still far from being over at this point. Take advantage of our worldwide service network - warranty, maintenance and spare parts supply included. Stay safely in control when turning and manoeuvring in traffic with the innovative video assistance systems: Put an end to safety risks caused by blind spots and non-visible areas. Dangerous situations often arise when turning, manoeuvring or changing lanes. The reason is that truck drivers are unable to see the entire area on the right-hand side of the vehicle in particular: A blind spot remains, despite checking the rear-view mirror and ramp mirror. Other road users and objects simply cannot be seen from the driver's seat. Our video turning system (VAS) offers a safe overview of the entire area next to your vehicle that was previously hidden. The 150° degree wide-angle camera mounted on the side of the driver's cab also captures the blind spot for you and transmits the video image either to the MMT dashboard or the monitor attached to the A-pillar on the passenger side. For even more safety, we offer you an extension for your camera monitor system with additional ultrasonic sensors: The four sensors, which are mounted on the front and side of the vehicle, continuously capture the immediate environment. They reliably detect any object within a distance of up to two meters to the driver's cab. If another road user approaches your vehicle, an optical signal will inform you immediately. An acoustic signal sounds if an obstacle is within the hazard zone when you are getting ready to drive off. A bird's eye view shows you the entire surroundings of your vehicle, including all blind spots. This is made possible by four HD cameras with a fisheye lens. Those cameras give you a 360° panoramic view of the immediate surroundings of the vehicle via the monitor in the cockpit. Master even the toughest manoeuvres with ease thanks to this complete overview. Minimise the risk of overlooking another road user or an obstacle when turning. MAN BirdView is automatically enabled when your vehicle moves at less than 15 km/h. In addition, the view of the surroundings on your monitor adjusts according to the situation. The system takes into account the current speed, the setting of a cornering light or the gear selection, among other things. The monitor gives you an optimal overview in every driving situation, allowing you to manoeuvre with centimetre precision and turn safely. With over thirty years of experience in building special purpose vehicles, the MAN Individual team is exactly the right contact partner when it comes to quick and top-quality implementation of your ideas. And there are virtually no limits as to what we can achieve for our customers. Depending on the complexity, we can implement your special requirements directly on the assembly line, on a specially designed separate assembly line, in stationary assembly, or via our network of certified modification specialists. Thanks to the special quality assurance according to DIN EN ISO 9001, you can always count on the high standards that you are used to from MAN, even for highly individual solutions. In the MAN Individual team, all threads run together. No matter how unusual your request might be: You always have your personal MAN contact partner who supports you throughout all project phases - from the initial quote right up to delivery of your custom-made vehicle solution. Our international MAN service network guarantees worldwide support and spare parts supply, no matter where you are. Despite having a tailor-made special solution, you still benefit from the usual service at your local MAN partner. With comprehensive MAN warranty and guarantee.